We left Florida June 1st and headed to our friend Aubree Becker's house. We chose 5 horses to take with us for this trip, we have a 6 horse trailer but we had a horse waiting for us in CA for the return trip. The drive to Kentucky was uneventful. The five horses hauled well, it was around a 10 hour day. We took Barbara Hershberger's horse, P, Sinister, Grand, Treasure and Tex. Once we arrived at Aubree's house we all just hung out for a couple of days. We also rode around her farm and enjoyed to scenery. It was very fun catching up with her. Our horses had a very nice grass pasture to hang out in as well. After a couple of nights in Kentucky we hit the road for Iowa. This was about a 13 hour drive. We arrived at the Olson's farm and put the horses out in a nice big grass pasture here as well. The horses were really happy. It was another uneventful haul. Always great when it's like that!! We spent the next few nights there. We enjoyed spending time with the Olson's and went swimming and to the farmers market and around town. It was relaxing being somewhere that you didn't feel like you should be doing a million chores, being away makes you have to relax. The next day we rolled in to the FT Howes base camp. It was still three days until the ride so camp was relatively empty. Our friend Lynn Kenelly has moved to this area and lives 6 miles from camp so that night we went to her house for dinner. That was a lot of fun. While we were there it was decided that Lynn's donkey, Andrew was in desperate need of a trim. It took three grown men and some drugs to get the job done! Andrew was much happier after his feet were fixed though. We helped set up the huge tent that ride meetings and dinner happen under, always a project. Later we vetted in and P passed his check but looked odd to us. We decided to withdraw him but since he was already vetted in it counted as a rider option pull. P had been looking stellar so it was disappointing to not get to start him. Jeremy and Barbara would both be crewing as well as Misty, Aiden and Lynn Kenelly. Very awesome crew. I would be riding with Dan and Matan on the FEI 75. I would ride Grand, Dan would ride Tex and Matan on Treasure. The next morning we all three headed out and had a nice first leg to the trot by on the top of the mountain. On the way back down, about 6 miles before the vet check Grand started to feel like his front feet hurt. Such a bummer. It would come and go. I knew I would probably be stopping at the next check. When we arrived he felt good but as we were only 23 miles into the 75 I trotted him out with the intent of rider optioning. He passed and I pulled. Jeremy cut his pads out and there was the fine sugar sand from Florida under the toe of one of his pads. He had really good packing in but that sand is so fine that it found a way in through the toe of the shoe. Hoof testers confirmed sole pressure and bruising. At least it was an easy fix. His feet were too soft from Florida to try to have continued without the pads. Oh well. This gave us the idea to check P's feet. P didn't have pads but did have a new type of shoe on. Sure enough his toes were sore as well. Very easy fix. 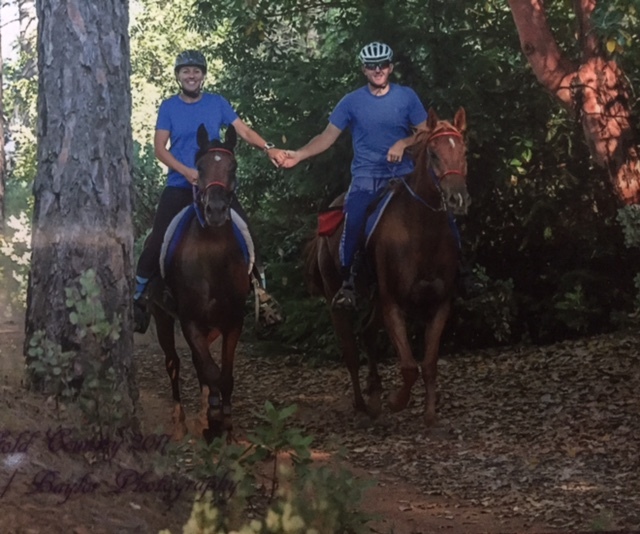 Matan and Dan continued on to have a very successful ride. Both horses looked great when they came across the finish line. Another great ride by these two riders. After the ride we packed up and the next day we drove to our friend Carl Knutchel's house. We had a really fun visit with him. The horses were all happy too. It was about 5:30 hours to Carl's house. After a HUGE dinner at Carl's we visited a bit longer and went to bed. The next day Carl fixed us a nice breakfast and we hit the road for our final leg of our trip, also the longest part. It was about a 15 hour day to Auburn, California. Along our drive we hit a little bit of rain but not much. When we hit the CA line and went over the Sierra's we could see a lot of snow. We arrived at Nicole and Josh Wertz house just before dark. The horses had a super nice irrigated grass pasture to go into. Nicole and Josh were there helping us unload. It was so nice to finally be in CA and to see Nicole and Josh. After we got everything situated we unhooked the truck and drove the two miles over to Adam Farmers where we would be staying. Adam was there waiting. Great to see him too. We got our stuff all set and hit the pillow. This next week (what was left of it as we arrived on Tuesday) we got things organized and Jeremy went up to Wild West to help Robert and Melissa with the trail work that needed to happen before the ride that weekend. Jeremy and I decided to enter on P and Grand as they had both gone so short or not at all the weekend before at Ft Howes. 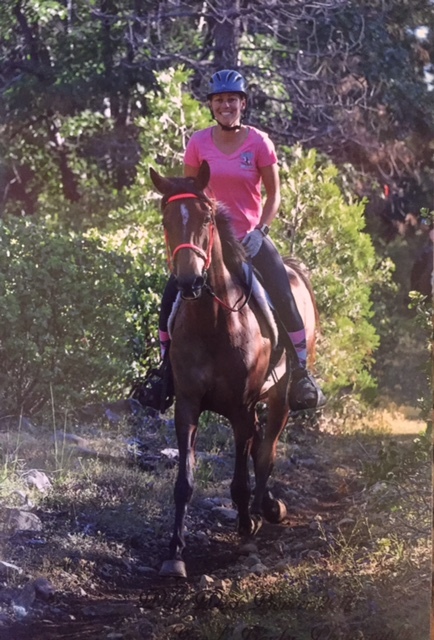 We trailered up to the ride the first day which was a 55. We stayed in an RV with our friend Carole Craft Edwards. She was going to do the LD with her Rocky Mtn horse , Turbo. Jeremy and I rode Turbo around the night before the ride. He is SOOOO fun!! Very motivated, smooth and eager to please. Very cool guy, he is 15.3 and a beautiful chocolate color with a flaxen/silver mane. We had a fun time with Carole, we haven't gotten to visit with her in so long. P and Grand did great. Whatever soreness they had had the weekend before was a thing of the past (and Jeremy had done their feet again to fix the earlier problems). P and Grand were stellar in the big hills. They came straight out of flat land Florida and went in the hills like nothing. They tied for third and Grand won Best Condition. Grand and I at Wild West. I forgot part of Grand's bridle so Carole lent me her pink set. It was a lot of fun to see the photographers Bill and Rene as well. It's been a long time since we last saw them. They always take such great pictures. We went home that night so Jeremy could help our friends work cows the next day. I went back up to the race to help Carole who would ride Turbo again. (Turbo won the LD on day 1!) On day two I drove up to the out vet check and waited for Carole and Turbo. I saw many friends and got to visit with them during their holds. Once Carole came in, I held Turbo while she used the rest room. It was really funny, another rider was saying hello and I asked how his ride was going. He was on the LD and told me that "some damn Rocky Mtn horse was going fast and that he couldn't keep up with it" I laughed and told him that I was holdimg "that damn Rocky" he was embarassed as he didn't realize that I was holding the reins of the Rocky he was taking about. It was pretty funny. I told him not to worry about it and that he was right, this Rocky IS fast. Carole went on to win the LD again. Turbo is TURBO! Carole and Turbo at the finish of the second day of LD's for the pair. I left after Carole was done. I wanted to go take care of our horses before it got dark. It had been a fun Wild West weekend. Jeremy and I have been riding a lot and running a lot since arriving in CA. The horse that was waiting for us here in CA is a horse that we bought from Tinker Hart named Sabre. He has been at Adam's house waiting for us since March. 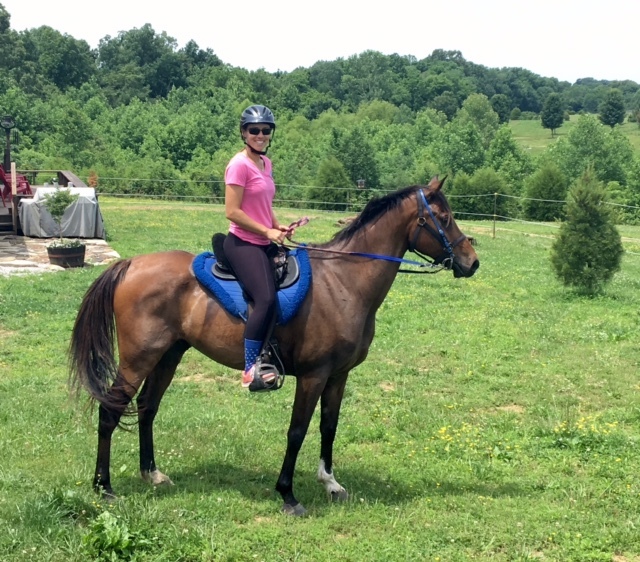 He is a very nice 9 year old, bay gelding. 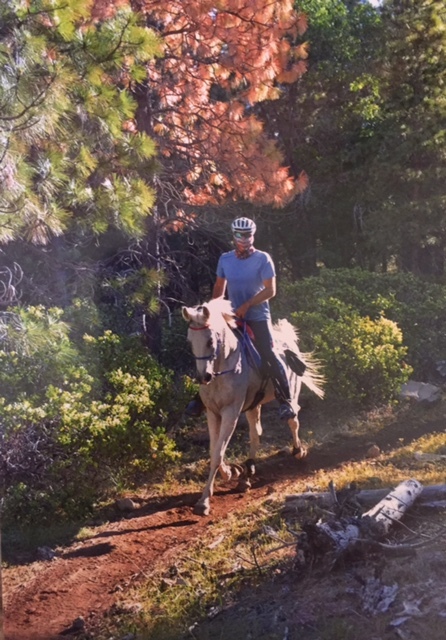 After riding him about a half a dozen times myself (this is not the first time he has been on training rides, just rides with me) I felt that he could do the Gold Country 50. He and Tex would go to the ride. About two weeks before the ride we had moved Sabre over to Nicole's to keep Tex company. Tex had been pushing P, Grand and Treasure around so we had moved him to a differnt pasture and Tex was lonely. During the first week Tex must have tried to corner Sabre and Sabre had fought back. Tex had a hematoma from a kick on the back of his hamstring. We gave Tex the week off and had ridden him and the swelling was mostly gone, he was sound and it wasn't tender. We went to Gold Country on Saturday morning as Friday night we were at a friend's wedding up in Foresthill (gorgeous wedding too). We vetted in and had Tex's hematoma noted on his card. Sabre and Tex were super at the start and went along very nicely. The trail was pretty challenging. It was very hilly. Just before the 40 mile mark Tex went lame behind. His hematoma had blown up and was super sore. Jeremy had to stop at the 40 mile vet check. Poor Tex, if we had realized that his hind end was going to be aggrevated we would not have brought him. He was really sore. Sabre went on to finish the day looking great. He is a very fun horse and I look forward to what he can do in the future. Sabre and I, and Tex and Jeremy at the Gold Country 50. Another Rene and Bill picture. We hiked Duncan Canyon this past weekend to flag areas that the trail crew need to fix. The canyon is very beautiful. We are really looking forward to riding the sections that are being used this year at Tevis. Our training is winding down for the big ride. Fingers crossed that Treasure and Grand stay healthy between now and then, so far so good. We look forward to seeing you at the Tevis.